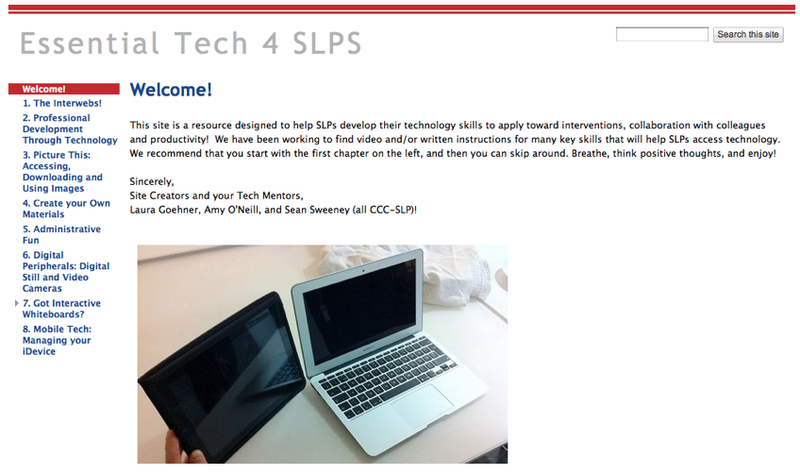 This info and video appears as part of our Essential Tech Skills 4 SLPs site but I wanted to make sure you ran across it, so am posting it here too! Apologies for the length of the video, but it was tough to make that mini-lesson more mini. The skills demoed here can be used to make your own visuals such as the PowerPoint cue cards I posted about some time ago. SLPs often have the need to create customized materials such as picture sets and graphic organizers. This generally takes us into the realm of desktop publishing, which can seem complicated. However, we find that it is easy to repurpose a presentation program such as PowerPoint or Apple's Keynote in order to create a worksheet or a visual for a student. Why these programs as opposed to Microsoft Word? Well, Word tends to want everything to fit in a word processed format, as in a typed report. It is difficult to move text and images around as you please. Not so with PowerPoint and Keynote. You can insert text boxes, images (see Part 3 of the Essential Tech Skills 4 SLPs site) or even draw items quite easily, click and move them around, and save them to print out and share with students (and colleagues)! ASHA Convention Wrap-Up: An Open Letter on the Importance of Open Technology. I really love going to the ASHA convention (despite ASHAs tendency to write it in print without the definite article the, I have to insist on it). I've gone 6 years in a row: Miami, Boston, Chicago, New Orleans, Philly, and now San Diego. Clearly I really like the travel, the vibe of learning and whom I get to see at the convention. This is not to say that there couldn't be some improvements each year, and I struggled with whether to write and publish this post lest it seem negative. However, as one of our technology spokespeople, I really feel strongly that I need to mention some points that would take this event from a good one to a GREAT one. ...there is a clear message to presenters that they are free to use their own equipment and devices in order to give the best presentation they possibly can. As a result, we don’t have things like PowerPoints about iPad apps, which limit the power of that technology and don’t give attendees a sense of how things really work. ...we have a user-friendly web-based scheduling application that can be accessed on any device (including mobiles) and allows participants to select sessions, access all information including handouts, and even see which of their colleagues share interest in sessions so that discussions can happen before and after presentations (I have been to several that used SCHED and found this an awesome tool). 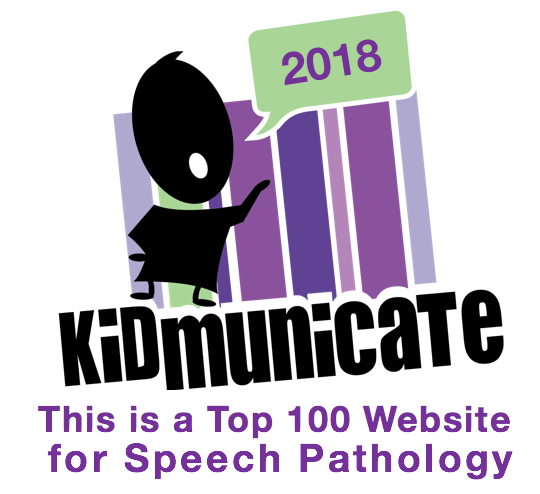 -presenters being able to demonstrate the abundance of resources related to Speech and Language Pathology while making presentations, without having to resort to using personal hotspots or flat screenshots. -facilitation of the previously made points, particularly access to supporting materials so that attendees do not have to (and this was definitely partly their fault) wait in (long) lines to print out itineraries and handouts. -instant access to websites and resources, including apps, so participants can explore as they are learning. -use of QR codes- imagine if at every door, poster and exhibition booth a QR code linked us to a handout, resource or website for further learning. -finally, greater opportunity to continue the conversation about sessions and backchannel using various outlets such as Twitter, Facebook, and ASHA’s new Community portal. Again, these tips are made with the best of intentions and from experience in attending conferences in which these things are considered, with wonderful results. Given that ASHA is reasonable to attend (admission fee-wise) relative to some conferences, I would be willing to pay a bit more to see these things happen. All meetings are subject to a technical glitch or twenty but if these possibilities were considered, I bet we will have an even better ASHA 2012. I look forward to it! Best individual blog- iLearn Technology's focus on edtech interactives and webtools for general educators consistently highlights resources that SLPs can put to use. Best individual tweeter- @SLPTanya, our Twitter Yoda, who not only co-moderates #SLPchat, but also has taken to posing discussion-baiting questions throughout the week under the hashtag #SLPsnQs (always archiving each in chirpstories). This is all in addition to her dedication to interpersonal engagement on Twitter. Best group blog- Though technically a podcast, I am going to give a shout-out to the folks at EdCeptional, a very thoughtful group discussion and shownote series on the role of technology in special education. Best new blog- all4mychild presents incredibly thoughtful and sophisticated evaluations of apps (and books, in their books4all branch) and bridges student engagement with tech tools into other activities that elicit real-world, functional communication. Best student blog- Though I have seen some terrific SLP grad student bloggers surface this year, I want to give recognition to Becoming OliviaSLP. With humor, grace, professionalism and terrific production values, her vlog series is making me wish she were around when I was in grad school. 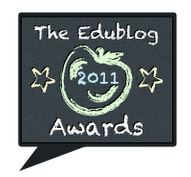 Best ed tech/resource sharing blog- Cindy L Meester has a great and very well-regarded blog that not only shares resources such as websites and apps in thematic posts (we love themes!) but also through an extensive curated list of static pages in her sidebar. Check it out! Most influential blog post- Barbara Fernandes' post for ASHAsphere- Gaming Into Education: Can Even Angry Birds Promote Learning?- is an extremely insightful and thorough example of therapeutic repurposing, showing how what is perhaps thought of as one of the most brainless apps is actually a goldmine of language- when we as SLPs make it so. Best twitter hashtag- #SLPeeps, a true online community in every sense of the word. Best educational use of audio/video/visual/podcast- A.T.TIPSCAST's Assistive Tech Specialist and SLP Chris Bugaj presents low- and high-tech adaptations that make learning accessible to all students, one digestible (and always funny and engaging) tip at a time. Best educational wiki- Karen Janowski's and Joyce Valenza's UDL tech toolkit is a one-stop (but extraordinarily robust) resource for implementing Universal Design for Learning across the curriculum. How lucky am I to get to actually work with Karen in my district?? Best open PD/unconference/webinar series- I went to my first unconference this year at EdCamp Boston and it was one of the best PD experiences I have ever had. Allow teachers to collaborate with each other, and watch what happens! Best educational use of a social network- Born this past December, the monthly #slpchat moderated by @speechreka and @SLPTanya has engaged participants in a wide variety of topics- all leave having learned and shared! Lifetime achievement- Connecticut special educator and Apple Distinguished Educator Meg Wilson is probably younger than I am, but has already established herself as the Queen of "Sharing Out"- from her groundbreaking iPodsibilities site to her adept, approachable hosting of the excellent MacReach podcast, to her involvement in I Education Apps Review. She's just amazing! Please check out these great resources if you are not doing so already! Hopefully some/all of these guys will be shortlisted, and I will let you know when the voting starts. Whew! What a trip the ASHA convention was, as always. It was really a whirlwind this year as it seemed I had a ton of people I wanted to see and talk with. In between doing last preps for our own session and chatting with folks all over the place, I went to some great sessions. I am not sure I can even consolidate all the info into an additional post, but I will try! In the meantime, if you haven't already, please check out the new site that my friends and colleagues Laura Goehner and Amy O'Neill developed for our presentation- Essential Tech Skills for SLPs. We envisioned this site as an updatable resource for SLPs to look at "one step at a time." If you feel you need help in the tech area, please visit it and look at it piece by piece (i.e. section 1A one weekend, section 1B the next), and try to practice the steps on your own. The site ended up working well (after jumping through many wirey hoops to get Internet access at this frankly tech-challenged convention) as a guide for our presentation, rather than a PowerPoint. During the session I mentioned the several presentations that discussed the importance of self-talk for our students- self-talk was highlighted both Sara Ward in her amazing executive function short course and the terrific panel of presenters on language intervention in science and social studies (which I talk about today over on the ADVANCE Speech in the Schools Blog). This is relevant because SLPs OFTEN use negative self-talk about their tech skills- "I am just not good at it," "I can't do this." We should be aware of this and use more helpful talk- "I can try this a step at a time," "I can solve this problem." We hope our Essential Tech Skills site will be one resource for you. It now lives in the right sidebar AND on the renamed Essential Skills page up the top of the blog. Please share it with anyone you think may find it helpful. Anyway, the ASHA convention has become for me much more than the CEUs and really about the people you can connect with inside and outside of the formal sessions. Thank you Maggie McGary, ASHA's Social Media Director, for again organizing a fun "Tweetup" where all the #slpeeps who have engaged with each other on Twitter got to actually meet and socialize (while putting down our devices for once). It was also great to receive some feedback as I walked around (and around and around and around) the HUUUUUUGE convention center. Believe me, "Aren't you the SpeechTechie guy?" is music to my ears, and I so appreciate the people who read this blog. Enough words, here are a few pictures (and OK, more words) from "the floor" of the exhibit hall and elsewhere. Comparing apps with Barbara Fernandes! It's all in the family at the Mindwing Concepts booth! The gang from all4mychild, Karen Head and Meghan Graham (whom I have also known forever and am so proud of, wow!) at the Social Adventures booth- the shirt says "I need my space," LOL. Today we are launching a new website: Essential Tech for SLPs! This site was conceived and created by my colleagues Laura Goehner, Amy O'Neill and me as a way to fill in some self-reported gaps in techKnowledgey by SLPs who would like to become more savvy. 1. The Internet- managing/updating browsers and curating the content you find through bookmarking. 2. Professional Development through Technology- Accessing PD opportunities online and developing a Personal Learning/Sharing Network (PLN). 3. Picture This: Accessing, Downloading and Using Images- Using the key skill of finding and saving images from the internet on your computer or iDevice. 4. Create Your Own Materials: Repurposing programs you have on your computer to create customized worksheets and visuals. 5. Administrative Fun: Calendar and scheduling tools, and Google Docs for Productivity. 6. Got Interactive Whiteboards: Resources to get you started in using interactive whiteboards in your pull-out groups or within the classroom setting. 7. Managing your iDevice: a TON of tips to help you understand your iDevice better. This site will be updated periodically and will "live" in the right sidebar here at SpeechTechie for your further reference. We hope it is helpful! Personally, I welcome the demise of the traditional "Handout." All that wasted paper! 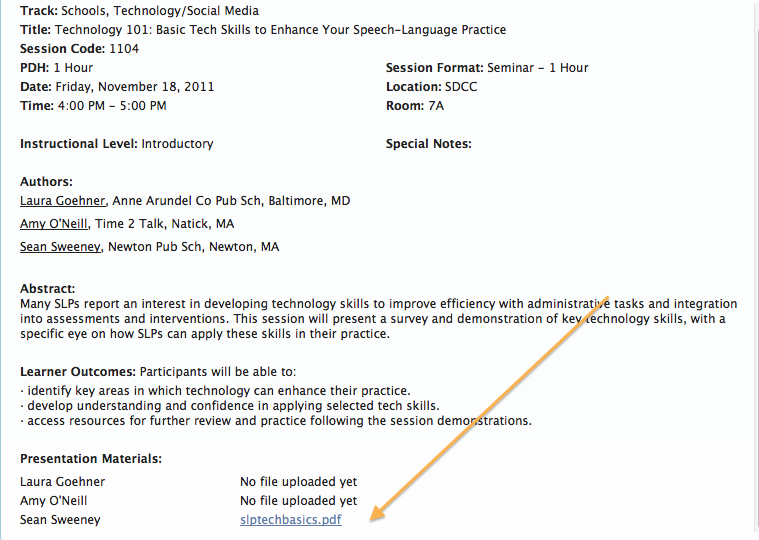 When attending ASHA, you can still (pretty) easily view presenter handouts, take notes on sessions, and even annotate (write over) the handout files on your iDevice! 1. Get acquainted with the Personal Scheduler. I am noticing this process does not work well on mobile devices, so you'll need to use a computer to transfer handouts to your iDevice. 3. Control-click (Mac) or right-click (PC) on the link and select Save Link As. 4. Take note of where you saved the PDF, and email it to an email you have access to on your iDevice. 5. Check your email on your iDevice, and tap on the PDF file to download it. 6. Tap again on the file to open it. a. Open in iBooks. The PDF file will save in your iBooks collection and you can read it while at the session. If you want to take notes, the Notes app that comes with your device is a good option. b. If you have installed a PDF annotation app, you will be able to open the document in that app by tapping "Open In..." My favorite is iAnnotate PDF ($9.99) but many like GoodReader ($4.99) or the free option, Neu.Annotate PDF. Hi Folks, just wanted to let you know about this professional development workshop I am doing for SPEAK in Michigan. “Outside the Box” iPad for SLPs- Apps Through a Language Lens! Friday, February 10, 2012 8 am to 3 pm (registration starts at 7:30) at the Washtenaw ISD Ann Arbor, MI. Many great apps were developed specifically for SLP interventions, but countless treasures in the App Store were designed for other purposes and can be applied creatively in our therapies! This workshop models “repurposing” of apps designed for gaming, visual exploration related to curriculum areas, organization, and creation for use in speech and language interventions. Apps related to professional development and productivity will also be reviewed, and attendees will leave with resources and experience in critically evaluating apps for potential use in their interventions. This workshop will be primarily geared towards clinicians who work with school-aged children, however, much of the information can be generalized to adult populations. -Analyze Apps and utilize task analyses to isolate speech and language objectives in context. -Apply criteria to evaluate Apps for clinical use. -Design therapy sessions using Apps, with Pre- or Post- activities targeting speech and language objectives in context. -Access a reading list of free online resources for further learning and exploration. Please visit the WISD website (www.wash.k12.mi.us) under Staff Development to sign up, or click here. Contact Emily Petrous at epetrous@wash.k12.mi.us or 734.994.8111 x1664 with questions. Draw a Stickman is an extraordinarily fun little interactive movie that caused some buzz on the Interwebs recently. 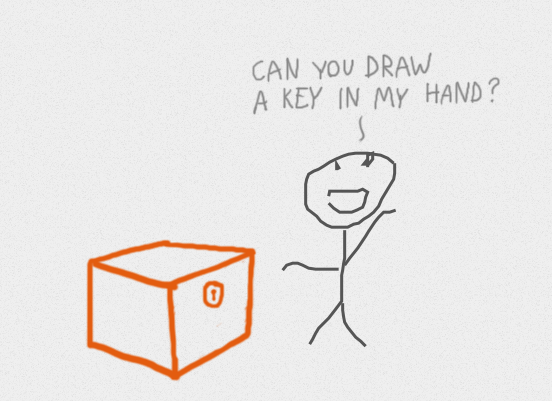 The activity opens by asking you to, naturally, draw a Stickman. I don't want to give too much away, but you will be asked to make a number of other simple drawings that save your Stickman from some predicaments that arise! Draw a Stickman unfolds as a short narrative with a clear, if sometimes unexpected, connection between events. It would be ripe for a story mapping activity and actually reminded me a lot of Remy Charlip's Fortunately, which would make a great pre- or post-context for using this website! Students will likely want to repeat the activity, which will allow for differently styled Stickmen and descriptive language. 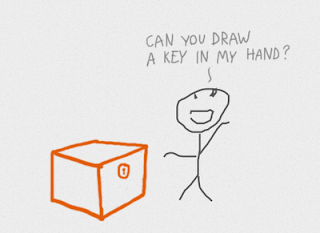 For more advanced students, you could consider storyboarding a sequel to Draw a Stickman: what would the user be asked to do and how would the story unfold? This would be a great use of Doodle Buddy. Note: Draw a Stickman appears to be part of the new generation of web development (HTML5) and therefore DOES work on your iPad in your Safari app! From experience in attending many ASHA conventions, I know that it's really important to take some time to plan your time! When you arrive at the convention center, you are likely to be overwhelmed and fall down, or cause someone to fall down, as I have in the past. To prevent unnecessary injuries, ASHA has provided us with a Personal Scheduler tool that will allow you to generate a "draft" list of sessions you might like to attend. You can print your itinerary, save it as a PDF and, for the first time, send it to a calendar app such as iCal (the Calendar on your iPhone/iPad/iPod Touch- YAY!) or Outlook (*crickets chirping*). I can't say there isn't room for improvement with this tool (and it still lacks some of the "social" aspects I have seen in other conference schedulers, which allow you to see which of your colleagues are going to which sessions), but these exporting features are a nice leap forward. Check out the short video below to see how it works, and happy planning! If all that sounds too complicated, you can just print away or send yourself the PDF to access on your mobile device! Have fun! I am very excited to be headed to the ASHA Convention in San Diego in Mid-November! It's going to be a really busy month, because I am also traveling to Florida next week to make a presentation for the NSSHLA Conference at NOVA Southeastern University. Whoo-hoo! Abstract: Many SLPs report an interest in developing technology skills to improve efficiency with administrative tasks and integration into assessments and interventions. This session will present a survey and demonstration of key technology skills, with a specific eye on how SLPs can apply these skills in their practice. · identify key areas in which technology can enhance their practice. · develop understanding and confidence in applying selected tech skills. · access resources for further review and practice following the session demonstrations. We plan this to be a fun, end-of-day session with a lot of interaction, allowing participants to ask questions about what they would like to learn about technology, both laptop/desktop and mobile, along with some presentations of key skills. Additionally, we will be unveiling a new website (not a blog) detailing essential tech skills and how-tos designed specifically for SLPs. 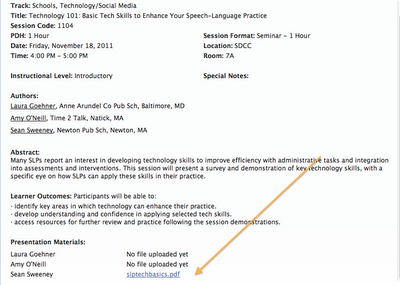 After the session, a link to this site will live here on SpeechTechie for all to see. Hope you can make it, whether you are a somewhat nervous learner or would like to come to share your own expertise and tech tips!